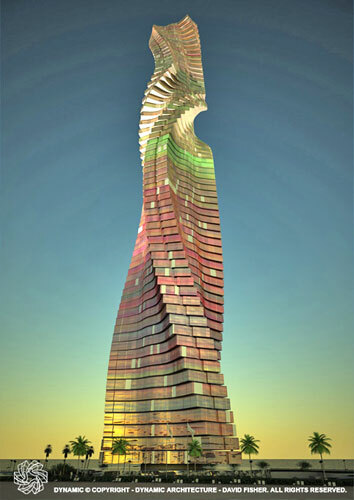 Italian experimental architecture company Dynamic Architecture has proposed a revolving sustainable skyscraper for Dubai powered by wind turbines placed between each floor. 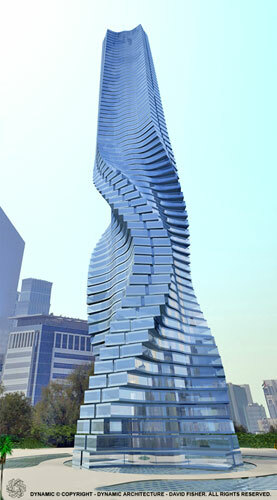 Each floor rotates separately, meaning the building’s profile will constantly change. 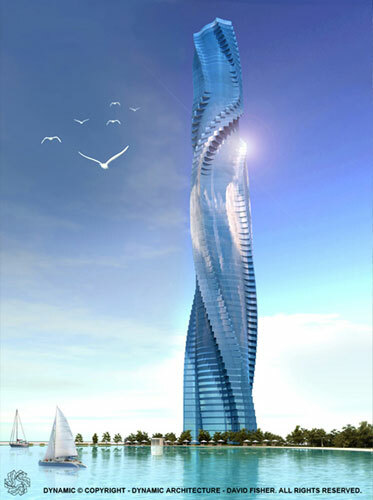 With 59 storeys and 58 turbines, the designers calculate the tower will generate enough surplus electricity to power a further five skyscrapers of similar size. Our Architecture employs wind turbines, positioned horizontally between each floors, which will produce energy to the building itself and will supply as well energy for several other buildings. A tower of 59 floors will have 58 wind turbines, making the building to be also a Power Station producing Green Energy in the city. Because if tomorrow is the time where we all are going to live the rest of our lives, we want it to be a really better place. The Dynamic Architecture building, which will be constantly in motion changing its shape, will be able to generate electric energy for itself as well as for other buildings. Forty-eight wind turbines fitted between each rotating floors as well as the solar panels positioned on the roof of the building will produce energy from wind and the sunlight, with no risk of pollution. The total energy produced by this inbuilt ‘powerhouse’ every year will be worth approximately seven million dollars. Each turbine can produce 0.3 megawatt of electricity, cmpared to 1-1.5 megawatt generated by a normal vertical turbine (windmill). Considering that Dubai gets 4,000 wind hours annually, the turbines incorporated into the building can generate 1,200,000 kilowatt-hour of energy. As average annual power consumption of a family is estimated to be 24,000 kilowatt-hour, each turbine can supply energy for about 50 families. 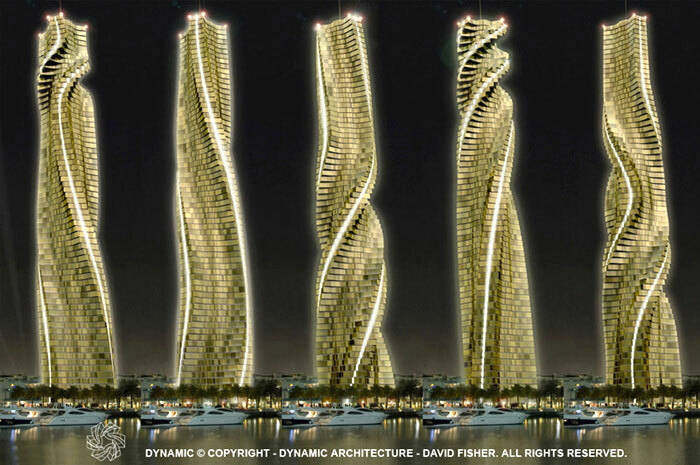 The Dynamic Architecture tower in Dubai will be having 200 apartments and hence four turbines can take care of their energy needs. The surplus clean energy produced by the remaining 44 turbines can light up the neighborhood of the building. 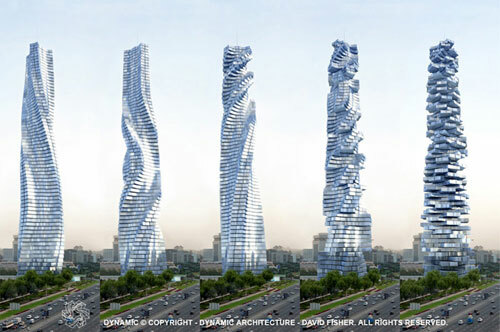 However, taking into consideration that the average wind speed in Dubai is of only 16 km/h the architects may need to double the number of turbines to light up the building to eight. Still there will be 40 free turbines, good enough to supply power for five skyscrapers of the same size. The horizontal turbines of the Dynamic Architecture building are simply inserted between the floors, practically invisible. They neither need a pole nor a concrete foundation. In addition, they are at zero distance from the consumer, which makes maintenance easier. The modern design of the building and the carbon fiber special shape of the wings take care of the acoustics issues. Producing that much electric energy without any implication on the aesthetic aspect of the building is a revolutionary step in tapping alternative energy sources. Furthermore, this energy will have a positive impact on the environment and economy. This architecture is revolutionary even in the way it’s built. It is in fact the first building produced in a factory, apart from the concrete core. 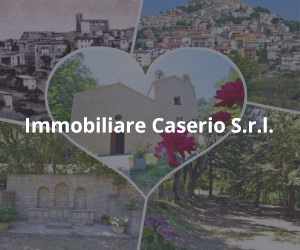 It’s produced of complete luxury units in a factory, including all plumbing, electrical, air conditioning and installed on the concrete core right on location. This ready made implementation offers high quality finishing, high quality control and the use of a very few workers on site, with a real cost, life risks and time savings. Besides, this architecture, made of single separated floors offer higher seismic resistance than any other normal building. 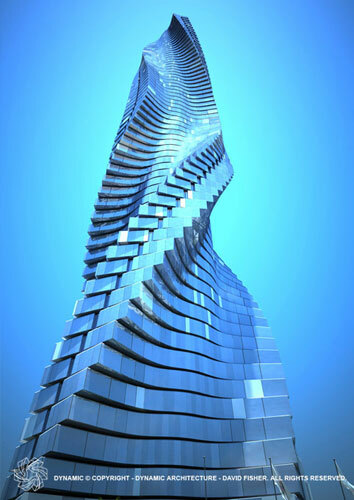 Dynamic Architecture is designed for better living even before it’s finished. Thanks to the fact that it’s built in a factory and just assembled on site, the number of workers on site is reduced from 2000 to 90. The ready made technology allows a revolutionary implementation which is the quickest way to build a tower: building time is reduced from 30 to 18 months. he revolutionary ready made technology, plus the fact that it moves to the wind, allows the building to be 1.3 times more resistant to earthquakes.